Twenty years of marriage. No matter who you are or where you live, that’s a big accomplishment. My husband, David, and I reached that milestone this week. How many people in my generation can celebrate a significant achievement like this? I was a young bride. We graduated from university and decided to get married and explore the world together. David and I weren’t quite ready to be real adults yet, but we knew that whatever we did, we wanted to do it side by side. 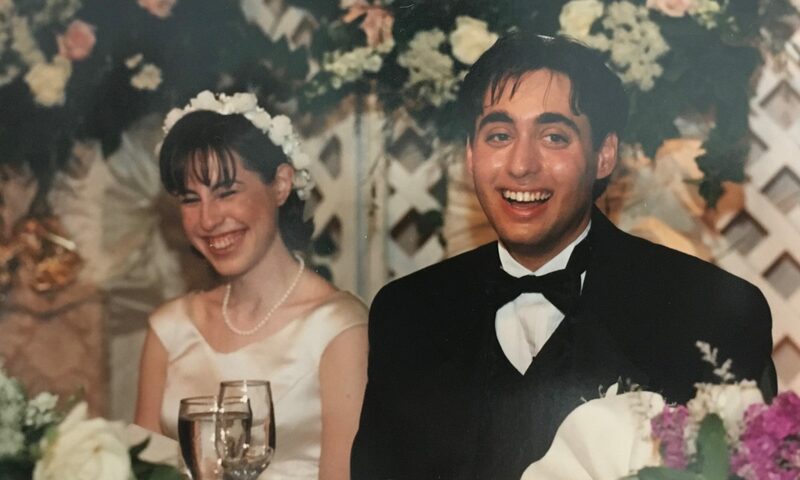 So, on a scorching hot day in late June of 1998 (I think it was 45 degrees with humidity) we wed and partied, surrounded by family and friends. There was even a massive thunderstorm, with a power failure, just as the festivities were winding down after midnight. We moved to the Normandy region of northern France that summer so that David could begin his work as an Engineer (thanks to David’s sister and her husband who had just moved there). We enjoyed a unique, very serene first 6 months of marriage, living in the countryside and experiencing the delights of life in France. Then we moved to Jerusalem for the next six months where David worked in the drinking water industry and I had a chance to get a taste of radio. 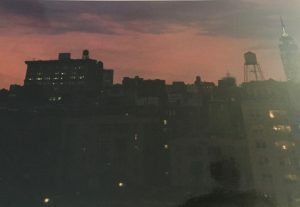 Our adventure did not end there, as I was accepted to journalism school in New York, and off we went to live in the heart of Manhattan for eighteen months. David worked for an engineering firm while I pursued my studies. We lived in a studio apartment in Greenwich village which was smaller than the size of our current living room! The bathroom was so small that I still can’t understand how a full-size bathtub fit in there. 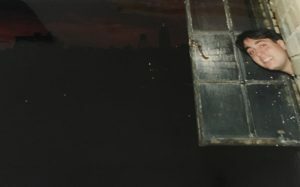 We had a view of the Empire State Building, if you had the courage to stick your head out the window and angle your body in just the right way. And we loved every minute of it. We had two windows. David is showing off the night view here while I took the photo. In 2001 we returned to Toronto after our multi-country adventure. It was the best way to start a marriage, to give us a healthy base from which to move forward in our life together. I know that not everyone is as fortunate as we were, to launch a marriage this way. To get to twenty years of marriage you don’t just need a solid start. As anyone knows who has achieved this milestone, or hit thirty, forty, fifty years or more, you work at it every day. We have had some vicious fights for sure, but we have also had some incredible adventures, built great memories and shed tears of joy as we brought three children into the world. Some people would say that marriage is just an institution and there is no need to formalize a relationship with a ceremony and signatures. For me, marriage is less about the formality of the process and more about sharing your life with a partner. When I have exciting news, the first person I want to share it with is David. If I am in pain or having a rough day, no one comforts me better than my husband. Moving through life with someone by your side, for me, is something important and wonderful. And to be able to do that for the past twenty years has been a privilege I don’t take lightly. When you dig deep, every marriage, whether it lasts twenty years or more or less, stays together or breaks up for a variety of reasons. From what I have read, it is estimated that approximately 40% of marriages break up in Canada, with the numbers being higher or lower in different regions. It is difficult to calculate if those numbers have actually increased over the years as there are many variables and also more common-law couples. I have enjoyed the look on people’s faces this week as I told them that David and I were celebrating our twentieth anniversary. I think the shock in their eyes was a mix of quick math, trying to calculate exactly how young I was when I got married, as well as admiration for being able to celebrate something so wonderful. And celebrate we will. Two kids are heading to overnight camp on Sunday and number three will spend some quality time with her grandparents as we take off for a week of road tripping and castle gazing in Scotland next week. This is a trip we have planned for a long time, and the celebration of twenty years of marriage is the time to do it. Follow me next week, on this blog, and also on Instagram (@AliciaRichler) and Facebook, as we drive on the other side of the road, visit lochs, castles and maybe even a couple of distilleries. A few weeks ago, in a moment of rage, my son broke the bathroom faucet. I will admit that the faucet was on its last legs and I had considered breaking it myself a few times. 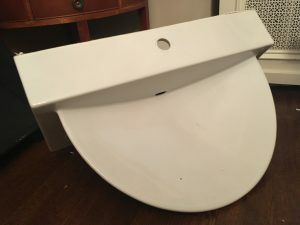 The wall mounted sink in our upstairs bathroom was not functional and its days were numbered. My son did us a favour. A replacement was in order. But the question we faced: do we go the “do it yourself” (DIY) route or just write a cheque as we embarked on this small home renovation? I’m not handy. 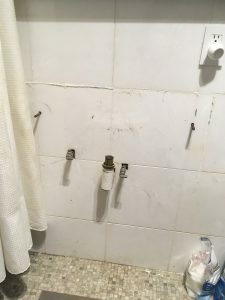 Basic home renovation – or rather home maintenance – tasks are often beyond me. Sure, I can change a lightbulb, but what many people would consider basic are often things I can’t do. For example (and I am happy to learn from a kind and patient person), I don’t know how to hang a picture on the wall. I have no idea how to install shelving. Plumbing? Electrical? Not a chance (but that is probably beyond most of us who are untrained). 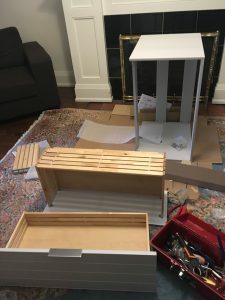 I learned many years ago that I have some ability to build basic furniture if I have a manual (with pictures) to guide me. 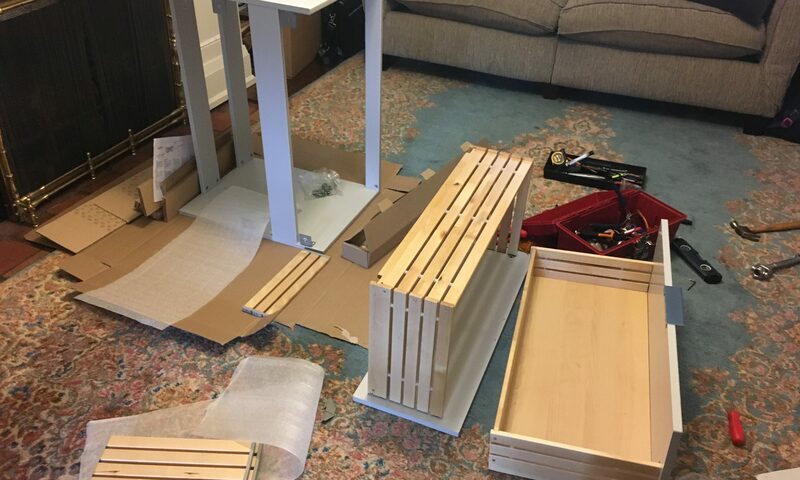 I built my son’s Ikea furniture and also helped put together our previous barbecue (the fact that it literally went up in flames a couple of years ago is not my fault). Hand me a hammer and some nails and show me where I have to bang things in and I will follow those basic instructions. But if things get complicated I get overwhelmed easily. Home renovation is just not intuitive for me. I watch those shows on HGTV in amazement when I see homeowners installing hardwood floors in the living room or a toilet in the bathroom. I have to say, I am in awe. 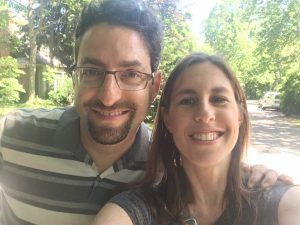 My husband, David, over the past 20 plus years since we have known each other, is becoming handier and increasingly following the route of DIY home maintenance and renovation. Our backyard deck will need to be replaced in the next couple of years, but David is fixing individual slots of wood as necessary. He installed our dishwasher a couple of years ago. He actually owns a few power tools and knows how to use them! So, when the faucet broke in the upstairs bathroom, David stepped in and decided he could fix it. Replacing the faucet of a heavy porcelain wall-mounted sink is not an easy task, especially for a novice do-it-yourselfer. It took him a while, but he did get the broken faucet out. But then he was stuck. There was no way to install a new faucet without removing the sink from the wall. I hate this sink. It has no counter and no storage. I voted to just smash it and get rid of it. Luckily, I eventually calmed down and our kind neighbour (a general contractor) came over this weekend and showed David how to safely remove it. That sink is not going back in that bathroom. I made sure of that (no the sink isn’t broken, it’s intact, but it will find another home). I bought a proper sink-vanity at Ikea soon after our faucet met its untimely end (okay it was actually timely) and the box sat in our living room for weeks. Once the sink was fully removed I jumped into action and started to build the vanity. It took me three hours just to get through the first few steps, and I got some help from my son and husband, but I am proud to say that I built most of my new bathroom vanity. It’s sleek and its functional, with two huge storage drawers and counter space. And I built it. But we are not finished yet. You see, when you go the DIY renovation route, everything takes a really long time. So, it’s great that the original sink has been removed (and is now sitting in the corner of my dining room) and that new vanity is built. But the sink and drawers are sitting on my bedroom floor, and as I type, David is trying to install the floating base of the vanity to the bathroom wall. We haven’t even started on the plumbing yet. The old bathroom sink’s temporary home: my dining room floor. The empty bathroom wall is waiting for its new vanity. Our neighbour has kindly offered to come over again this week to ensure the vanity is firmly installed and the plumbing is right. And maybe the sink top will go on and the drawers will slide into place. Oh, how nice it will be to brush my teeth in my new bathroom sink. When embarking on a home renovation writing a cheque is definitely easier. Doing it yourself is definitely more challenging and sometimes more stressful, but when it’s complete, it’s definitely worth it. Has My Life Become a Children’s Cartoon? Did the Big Red Chicken really just turn Boots the monkey into a chicken? Was that Daddy Pig who just fell through the school roof? I think Sophia just saved Enchancia from another evil wizard. Did Max really put bugs into Ruby’s jelly mold? These questions actually fill my head. And these are not real people. These are children’s cartoon characters, and they have taken over my life. I will admit it: my children watch too much television. It’s just too easy to flip the TV on when I’m busy working, cleaning or preparing dinner. Whether it’s after school or a weekend morning, sometimes I just turn on the TV for the kids and encourage them to watch a cheesy cartoon like Dora the Explorer, Peppa Pig, Sophia the First, Max and Ruby or a whole host of others. You can criticize me if you want and tell me I am lazy or that my children could engage in a number of other higher quality activities. And sometimes you are right. Sometimes they do. My son could throw a baseball or basketball around the backyard for hours. My older daughter’s bedroom looks like a hurricane of Playmobil passed through. The baby likes to colour, play with her dolls or follow her brother and sister around. They don’t watch TV all the time, but when they do, the sounds of the cartoons permeate throughout the house. Have you ever noticed that the music of every children’s cartoon is annoyingly catchy and gets stuck in your head? For those of us who were children of the eighties or nineties, are those cartoon themes still in your head? My brother and I loved to watched the weekly line-up of cartoons on Saturday morning. I still sing the Gummi Bears, Smurfs, Muppet Babies, Teenage Mutant Ninja Turtles, among others. They get stuck in my head and I can’t get them out. I think my complete Spanish vocabulary came from watching years of Dora the Explorer with my children. I can count to ten, I know many colours and know how to say let’s go – vamanos! Is that useful? I’m not sure. But I am sure that my two-year-old can count to five (in English) because of Dora. And she gets up and sings and dances with Dora and her friends. So, it can’t be all bad, right? But the children’s cartoon seems to be everywhere in my life. It’s not just about the actual TV show and it’s annoyingly catchy music. There is the retail side of things. 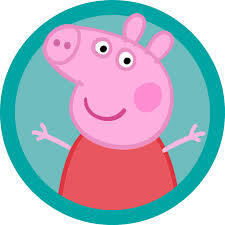 My younger daughter only wants to wear t-shirts that have a picture of Peppa Pig on them. My older daughter is taking a collection of Paw Patrol pillows to camp as somehow a pillow is only cozy if there is a picture of Skye or Chase on it. And the toys. We couldn’t just get one or two pups from Paw Patrol as my daughter insisted that she could only re-enact a scenario if she had all the dogs. When my son was a toddler he couldn’t get enough of the Thomas the Tank Engine trains and we bought dozens of them – along with tracks. Over the years my home has become a warehouse of toys, clothes and other paraphernalia connected with a cartoon. Don’t even get me started on Frozen. I have my favrourite TV show, House Hunters, on in the background as I write this afternoon. But soon the children will be home and floor plans and backyards will be replaced by singing monkeys and talking rescue dogs. Cartoon theme songs will jump – and stay – in my head. It will surround me. I’m ready. Can you be a Tourist a few Blocks from home? I love to travel around the world and often start planning my next trip while traveling on another. I was lucky enough to visit family in Israel in April then have a bonus few days to be a tourist in London with my husband and kids. And in a few weeks, to celebrate our anniversary, David and I will be in Scotland for a few days (details coming in July!). But as I plan all these fabulous trips I sometimes lose sight of the great things to see and experience in my own city. Not only my own city, my own neighbourhood. I had the opportunity to play tour guide to a good friend of mine this week who was visiting from Western Canada. Adam actually lived most of his life in Toronto and moved with his family to Kelowna ten years ago. He has taught me so much about architecture, heritage homes and walking through old city neighbourhoods. It’s hard to find even a small part of the city that Adam hasn’t seen. But I found one, just a few blocks from my home. I have tried to be a tourist in my own city as often as I can, discovering beautiful hidden gems like Spadina House, for example. But sometimes it’s more than about just one house – it’s a whole neighbourhood, of houses, trees, a park and even a pond. I am referring to a small, private enclave in the heart of Toronto called Wychwood Park. It was created late in the 19thcentury as an artists’ colony and named after a town, called Wychwood, in Oxfordshire, England. The area was rural and the city grew up around it. There is even a creek that was damned to create a large pond, in the centre of the neighbourhood. Taking a walk through this neighbourhood on a beautiful spring afternoon is my idea of heaven. 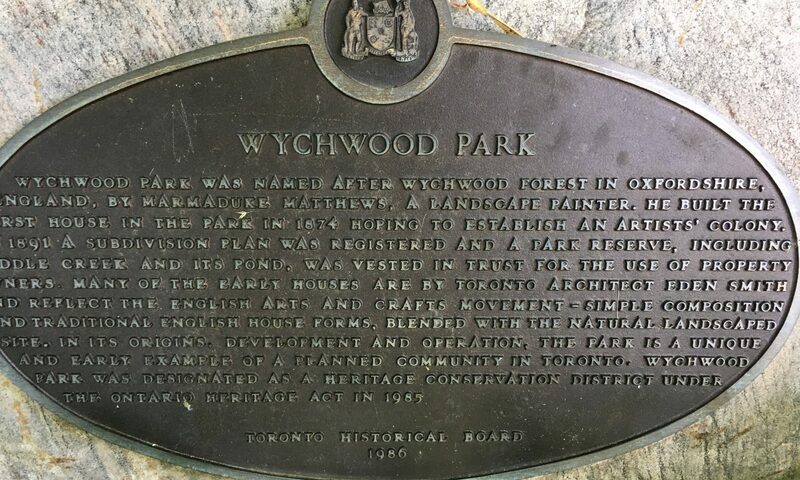 Deep in Wychwood, surrounded by spectacular homes, two-hundred-year-old trees and even a pond, on the edge of downtown Toronto, is something special. You can’t even hear the noise of the city with all its hustle and bustle. And Adam, the guy that knows everything about Toronto, its neighbourhoods and heritage homes, had no idea this special place existed. We walked slowly on the quiet streets of Wychwood Park then continued our tour through the wider area, with so many more beautiful streets. Our tourist in my own city afternoon was capped off with a visit to the delectable Dutch Dreams. This place is more than just your basic ice cream parlour. You will find the usual basics like chocolate, vanilla and strawberry. But there’s also fun flavours like caramel turtle fudge, moose droppings or Hawaiian delight. We each chose a single scoop in a sugar cone. At most ice cream parlours that’s all you get. But not at this place. 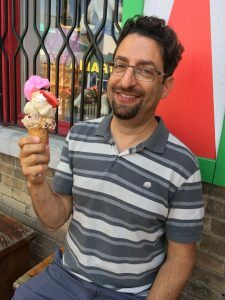 Adam was a bit overwhelmed when his “single scoop” cone was topped with fresh fruit, whipped cream and even cotton candy. Yes, he ate the whole thing. So did I.
Adam happily tackled his ice cream! I just loved being a tourist in my own city again, really in my own neighbourhood. Living in the heart of the city I am surrounded by gems like Wychwood Park. Adam, when you visit Toronto again in a couple of months, let’s find another. I feel privileged every day that I live in a free, just and democratic country. I take nothing for granted in my life, and when it is an election in my city, province or country, I take my privilege to vote very seriously. As I write, it is late afternoon on Thursday, June 7th. It is election day in the province of Ontario, and it’s been a hard fought (sometimes nasty) campaign. I am not going to use this space to share my opinion on which candidates or political party would be better for the province of Ontario. I don’t support any specific political party and choose who I vote for very carefully. 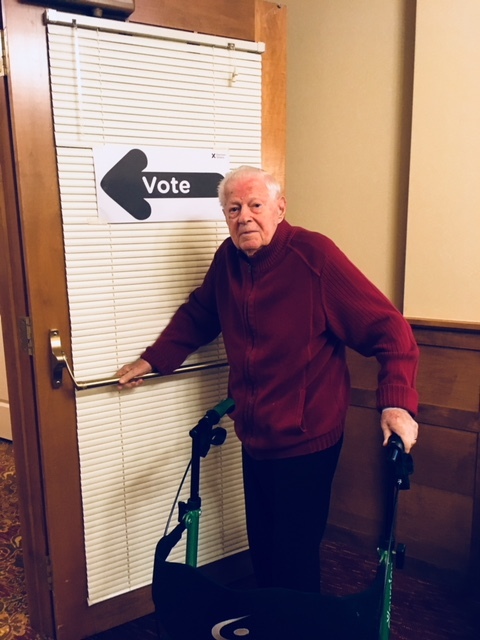 Whether it’s at the municipal, provincial or federal level, day to day I am non-partisan and support candidates and elected officials for various reasons. Again, who I actually voted for today is not relevant here and I am not sharing my choice. What is relevant is that I voted. I always vote. It always amazes me that so many people in countries like Canada choose not to vote. Whether your candidate of choice wins or loses, I believe that all citizens who are the age of majority are obligated to cast a vote. For example, only 52% of eligible citizens voted in Ontario’s last provincial election back in June of 2014. Federal election turnout was better three years ago when 68% of eligible voters cast a ballot. Media reported “higher voter turnout” after Toronto’s 2014 election, which saw 60% of eligible voters participate. Why should we be satisfied with a turnout of 60%? Shouldn’t we strive for 100% participation, or close to it? If someone can’t vote on election day, there are ample opportunities to cast a vote before. Or remotely. Our democracy doesn’t just encourage us to vote, it obligates us to do so. I remember watching the news about 15 years ago when open elections came to Iraq. This was a country that was under brutal autocratic rule for years. There was no such thing as open, free and fair elections for the people. Iraq was still a dangerous place after the regime was toppled. Democracy was in its infancy. And there were elections. People waited in line for hours, and many of them risked their lives just to cast a vote. Polling stations and those long lines were often attacked. Scores of people were killed. But they had to vote, or at least they had to try. I remember reading the stories and watching on TV and was in awe. The ability to vote was so easy for me, living in an established democracy like Canada. How could I not always vote? How could every Canadian not always vote? And yet many do not. I hope the voter turnout increased today from its previous number of just 52%. The provincial government in Ontario is going to change today. Many people will be happy and a large number will be angry. But in my mind, unless you voted you do not have a right to complain about your government. The person for whom I cast my vote may or may not win. The party of my choice may or may not be in power tomorrow, . but I participated in the process. And I always will. **That’s my grandfather, age 97 (98 in a few weeks!) voting today. He is someone who taught me the importance of voting. I don’t take anything for granted.Every day I am grateful for everything I have. Some things have come easily for me and to me while at times I have also struggled. Over the past couple of weeks I have seen a number of people close to me – family and friends – accomplish, overcome, succeed, struggle and even sometimes fail. I have felt a mix of emotions as I have experienced great joy and great sorrow, all on the same day. At the end of a very busy and eventful weekend, I feel blessed for good health. I received a call early Friday afternoon from my daughter’s school that she had a low-grade fever and seemed lethargic. She had to go home. Kids get sick. It happens. No problem. I brought her home, she flopped onto the couch with her iPad and I quickly threw together a batch of chicken soup in my trusty Instant Pot (makes THE best chicken soup, full of flavour in 30 minutes. I’m serious.). The soup perked her up a bit, but my husband noticed a strange white pimple-like item on her right knee in the early evening. I will admit I didn’t notice it earlier but decided to check it out. Indeed, there was a rather large white circular item in the centre of her knee, surrounded by a red circle. The knee was swollen and warm to the touch. I quickly put two and two together and realized my daughter had an infection of some kind. What do I do? It’s Friday night. She has a fever. Something is going on in that knee. I chose the paediatric after-hours clinic. It had a 60-minute wait, but I decided it was my best bet. We waited. And waited. Finally, my daughter was seen by the paediatrician. He looked carefully. He asked her to bend the knee in different ways and he touched it to feel how sensitive it was. I watched and noticed the slight fear on his face. He was worried. Something was wrong. He looked at me and said that it was probably only a surface infection, and it probably had to be drained. But he also wanted to make sure it wasn’t in the knee joint or a sign of something else. He wanted us to go straight to the emergency room. By this point it was 10:30 pm. My daughter was exhausted, didn’t feel well and was in pain. The swelling was getting worse. I decided to go to the community hospital and not downtown to the Hospital for Sick Children (the paediatrician suggested this), and we were on our way. Two levels of triage and registration then a waiting room. At 1:00 am my daughter was seen by an excellent emergency room physician who determined that it was just a surface infection. The knee was drained and she was put on antibiotics. We arrived home at 2:30 am, and I crawled into bed. It was a long night, but my daughter was fine. All evening I had horrible thoughts swirling through my head. Did she have some flesh-eating bacteria? Was this white pimple just the tip of the iceberg of something terrible like leukemia? A hospital waiting room is a bad place to have time to think. Which brings me back to why I feel blessed for good health. My daughter is fine. She is healthy. It looks like she had a mosquito bite that she scratched and became infected. A seven-day dose of antibiotics will fix everything. But I don’t take her health for granted. I only had a few hours of sleep Friday night and woke up relatively early Saturday morning to participate in our neighbourhood’s annual yard sale. My family decided to do a bake and lemonade sale and donate all our proceeds to a local charity (luckily, I did my baking Friday afternoon). Not everyone is as lucky as I am to have a wonderful family in a beautiful neighbourhood, blessed with good health. 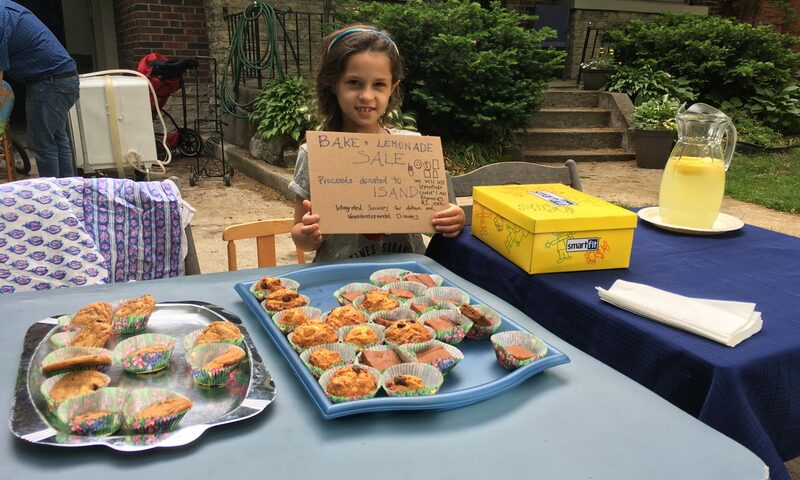 It seemed poignant to me that my daughter was the most enthusiastic about our bake and lemonade sale. She limped outside and sat proudly at our table. She was a natural at selling and upselling, and we sold out. My son squeezed the lemons for our fresh lemonade and the baby, well she just acted as our cute mascot. We raised $128 for a wonderful organization called ISAND – Integrated Services for Autism and Neurodevelopmental Disorders. Today I feel blessed. Good health for sure. A great community. And smart, insightful doctors at my local clinic and hospital. It was a busy, eventful weekend. And we are all fine. And healthy.